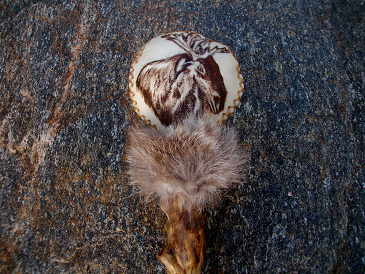 By the artist "Moon Cat", the Moose Rattle embodies the energies and medicine of the Moose. The Moose gracefully navigates the thickest of frozen swamp lands, and thrives in some of the harshest natural environments on Mother Earth. The Moose is a very grounded and solitary four legged creature. Thus, as a companion the Moose teaches us how to gracefully navigate and stand strong in our Authentic truth within our environment. 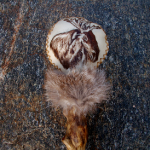 This Rattle is made from rawhide and contains organic corn, selenite and clear quartz crystal within it. The handle also has rabbit fur on the top of it.